My passion for spinning is still in full force. I love the music, I love the challenge, and most of all, I love that it’s only 45 minutes of hell– and you’re done. A few months ago, I witnessed an unfortunate mishap during my Thursday morning class. 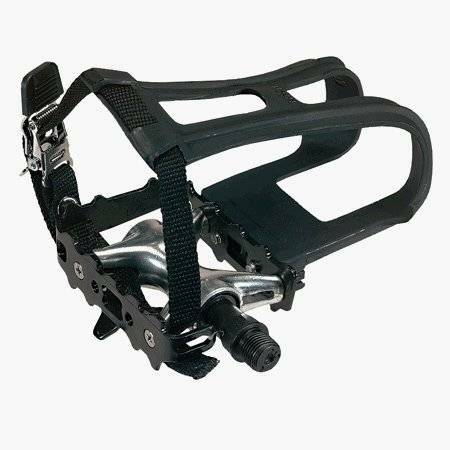 An older woman was using the bike next to me, and I noticed that she had her pedal straps adjusted very loosely. Rule #1 of spinning: if you’re using straps, make.sure.they.are.tight. I remember when I took my first class, the instructor introduced herself to me and checked my bike setup. Then she looked down at my (what I thought was) sufficiently adjusted straps, grabbed the strap with her hand and pulled it so it was completely snug around my foot. Then she said, “make sure these straps are tight!” “Okay,” I thought…. Message received. Clearly the woman next to me didn’t get this memo, and to be fair, our instructor hadn’t introduced herself or asked anyone if it was their first class that day, like they are supposed to. I looked over to see the poor elderly woman next to me lying on top of her spin bike, her chest against the brake knob and her feet splayed out awkwardly to her sides, clutching her chest in pain. Our instructor came running over, only to find out that the woman hadn’t tightened her foot straps at all – thus, when we sprinted like hell, her feet flew out of the straps, causing her to lose her balance and just totally eat it. Luckily, the woman was okay, save the big red mark and probably bruise that she’d develop on her chest where she hit the brake knob. After class, my instructor talked to her about getting spin shoes. She climbed on the bike and clipped her shoes in, demonstrating how it improves your pedal stroke and keeps your feet totally secure while pedaling. She said they are totally worth investing in if you spin on a regular basis. As I was cleaning off my bike and gathering my things, I thought to myself that I should get spin shoes. Soul Cycle requires them, and about 70% of the women in my regular classes wear them. I was kind of wary though, because of my experience with the clipless pedals at Soul Cycle. My feet never felt 100% secure in those shoes, and I had one hell of a leg ache the entire day after the class. However, I decided to attribute that to the fact that I wasn’t wearing my orthotics and that the rented shoes were heavily used when I wore them. I decided to bite the bullet, and buy myself some spin shoes. Luckily, there is a store right next to the library where I work. 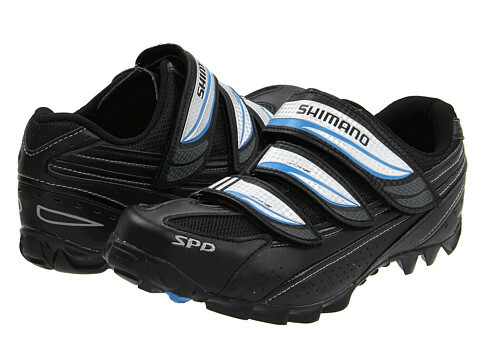 I went in and explained that I needed shoes for my gym’s spin class, showed the man the type of pedals that my shoes needed to clip into (SPD), and asked for suggestions. Most pedals have what’s called a “cage” on one side, which needs to be securely tightened around your shoe, as pictured here. On the flip side of that same pedal, there is a cleat system, as pictured here. Spin shoes are affixed with a cleat at the bottom of the shoe that actually clips into the corresponding cleat on the pedal. So our class starts, and everything seems to be going okay. Thing is, I couldn’t shake the feeling that my feet were moving from side to side as I pedaled. The salesman in the bike store told me that this was normal, because apparently, if the straps are too tight and your feet are completely stationary, it’s bad for your knees. The woman at Soul Cycle told me something similar. Still, this was a completely different experience than I’ve had with the toe cages, where your foot is Fort Knox secure. I also felt that the placement of the clip forced my foot to be situated in a weird spot on the pedal – almost too close to my toe. I made it through the class, and I did notice that I was using some different muscles than I usually do. However, I felt that I was overcompensating for my shaky feet by clenching my knees very tightly as I pedaled. I left the class, no worse for the wear. However, when I got to work that afternoon, I noticed that the entire side and back of my knee and the muscle alongside the bone of my shin was extremely sore. I have a pretty high pain tolerance, but I had to take Advil at work because the pain was so bad. Well gee, why didn’t I think of that? I’ve had my bike set up by several instructors, including those at Soul Cycle, so I know it’s not the setup. Plus, since Soul Cycle requires you to wear clip-in Spin Shoes, I doubt they’d admit that there could be a potential risk in using them. After doing some research and reading forum posts like this and this, I found out that many serious cyclists actually have to tweak the adjustments on their pedals and clips in order to maintain the proper angle for their feet. In fact, many other riders have had serious knee issues from having their cleats set up incorrectly. This makes perfect sense – why would an out-of-the-box shoe fit everyone the way it’s supposed to? Everyone’s gait and cycle stride is a little bit different. Not to mention the fact that all the shoes are built to have the clips attached to the same spot of the shoe. Now, if the cleats are all on the same spot, how is it possible that someone with a small sized foot and someone with big feet like mine (size 11) can ride the same way? I don’t see how it’s possible. Add to that the fact that I have monster inserts – orthotics that look more like wedges than the cute Dr. Scholls ones you see at CVS – and I’m becoming more paranoid over screwing up my already tender feet. If I had my own bike and could adjust my cleat and pedal system to be perfectly in synch with my foot, that’s one thing. But I’m not wasting the frustration on shoes that I wear to a public class. By this point I had had enough. Thanks to Zappos’ almost eerily fast shipping, I had the shoes in time for my next class. As I suspected, these shoes, sans clips, worked out perfectly. 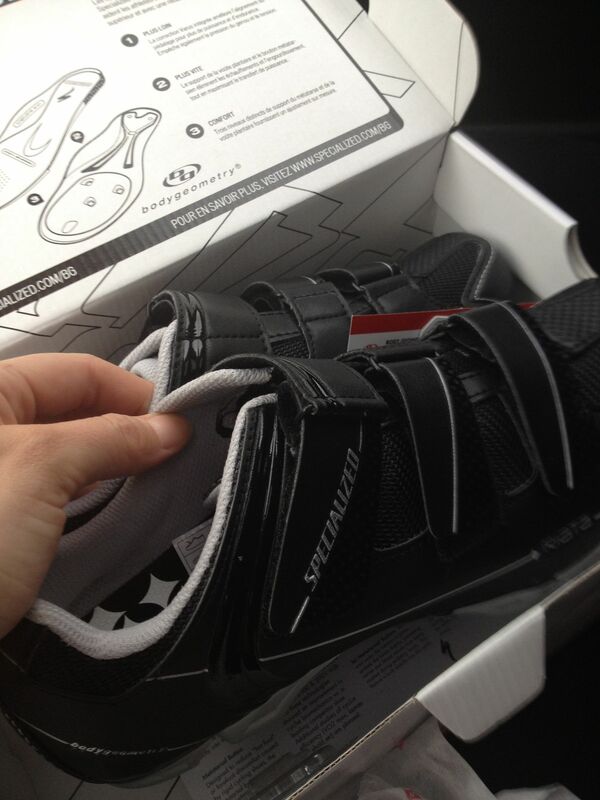 The stiff soles made my pedal stroke stronger, and the fact that I could use them with the toe cages was great. I will never spin without these again. So, what’s the moral of this long-winded story? Trust yourself. Trust your body. You know yourself best. If something doesn’t feel right, don’t keep doing it. Don’t worry about the other soccer moms in the room who clip in and out of their spin bikes as easily as getting in and out of their cars. If you keep doing something that hurts, you could end up injuring yourself so severely that you won’t be able to do much of anything anymore. And to me, that’s the scariest thought of all. ‹ Happy Belated Birthday, Leonardo Dicaprio! Yes, you do need to buy separate cleats to go with the shoes. The bottom of your Shimanos should have two oblong holes in the soles. If you take them to a bike shop, they can attach the cleats for you. However, sometimes they need to be adjusted if you find that they are causing your legs and feet pain after riding. The bike store should be able to adjust them for you. Better yet, go to a store where they have some sort of stationary bike so that you can try them on and have them adjusted accordingly in one visit. I agree. I do feel better without spin shoes and just wear shoes in toe cages. I’m a spin instructor.